The House will soon release its own proposal to reform the U.S. Postal Service, lawmakers announced at a hearing Wednesday. The package may be smaller in scale than the bill in the Senate with bipartisan support, with leaders of the House Oversight and Government Reform committee saying they were committed to finding areas of agreement and leaving out those causing “heartache.” The announcement came at the end of a hearing with postal management and various stakeholders to examine issues at the cash-strapped mailing agency. Rep. Jason Chaffetz, R-Utah, chairman of the oversight committee, said he was confident the forthcoming bill -- which he expects to float as a discussion draft “soon” and to follow up thereafter with a formal bill and markup -- will have bipartisan support. 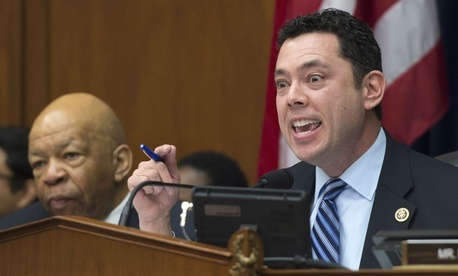 “We’re pretty united on this,” Chaffetz said after the hearing in which he praised members on both sides of the dais for their time, effort and collaboration in conceptualizing the tenets of the bill. Rep. Elijah Cummings, D-Md., the committee’s ranking member, said after hearing, “We are probably closer than we’ve ever been” to getting a long sought after postal bill to President Obama’s desk. In previous congresses, Cummings introduced his own postal bills to offer what was viewed as a more employee-friendly alternative to measures put forward then-Chairman Darrell Issa, R-Calif., and in the Senate. The approach in the House appears to mirror a strategy prescribed by Senate Homeland Security and Governmental Affairs Committee Chairman Ron Johnson, R-Wis., who has not yet joined several members of the majority party on his panel in signing onto a comprehensive bill authored by the HSGAC ranking member, Sen. Tom Carper, D-Del. Johnson said in a hearing in January that Congress should take a narrower approach to legislatively alleviating some of the Postal Service’s most urgent concerns, rather than attempting to stuff everything into one bill. Cummings conceded the Senate bill may contain “a few things” that do not appear in the House bill. “We are trying to figure out what we can agree on,” Cummings said. “And if there are things that just cause heartache by either side, I would think that those things would probably not necessarily be there.” He added that what appears in the final language of the bill is still fluid and up for negotiation. Wednesday’s hearing revealed several common threads upon which most stakeholders, including lawmakers in both parties, Postmaster General Megan Brennan, large mailers and unions, agreed. It appears likely the House will follow the Senate’s lead in requiring postal retirees to enroll in Medicare, rather than the Federal Employees Health Benefits Program, as their primary health insurance. The transition would save the Postal Service billions of dollars annually and significantly reduce the unfunded burden of future retirees’ health benefits. USPS made about $50 billion in congressionally required payments into an account to fund the future benefits, and has since defaulted on required annual payments that have made up the bulk of the Postal Service’s reported losses over the last several years. Both labor and postal management identified Medicare integration, and the resulting reduced prefunding burden, as a key element of any postal legislation. Lawmakers also appear likely to move forward in making permanent a temporary price increase that expired in April. The higher rates generated $4.6 billion for the Postal Service in the nearly 28 months they were in place. Chaffetz was less inclined to expand postal business opportunities to things currently offered by the private sector, a flexibility for which many, including Brennan, have advocated. The chairman did say the Postal Service should leverage its in-every-community network for government-to-government services, such as passport and Census assistance. Lawmakers repeatedly praised the previously disparate postal community for coming together to offer solutions, especially highlighting the sacrifices and efforts of postal unions. “We cannot ignore this,” he said. Absent from most lawmakers and the postmaster general’s wish list was a previous call for the elimination of Saturday mail delivery. Brennan said she spent the last year “trying to build consensus,” and there was simply no appetite for the plan her predecessor once tried to implement before the Government Accountability Office blocked him. Rep. Stephen Lynch, D-Mass., among the lawmakers Chaffetz acknowledged for working to put together the committee’s imminent postal bill, agreed with his colleagues that a smaller approach was necessary. With the Senate working on its own legislation, which so far has not received a vote in committee despite its bipartisan support, both chambers passing their bills would likely trigger a conference committee to work out the differences. Carper, unquestionably the top advocate for postal reform in all of Congress, applauded the oversight committee for holding the hearing and promising reform language. “I hope that this dialog bears fruit and helps Congress come together to enact much-needed postal reform legislation,” Carper said. For his part, Chaffetz promised to “work with” his Senate counterparts.